A simple and classic 48" Wood & Metal Sleigh for your holiday season. 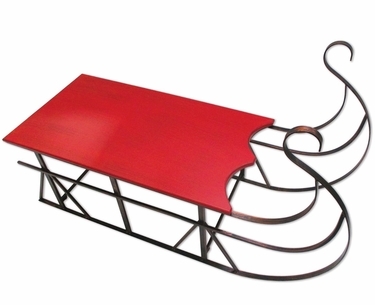 This decorative sleigh features festive red wooden seat and black metal runners. Plenty of space to stack presents or showcase other holiday statuary and fun. Together in minutes with easy assembly and enjoy all season long! Great for Christmas decorating indoors or out, it will help get you in the holiday spirit. Use alone, or coordinate with other decorations, and fill your home or office with festive cheer. Fill with holiday stuffed animals, presents at a gift exchange, and more! Perfect for stacking presents or showcasing decor!